Light, Sweet, and refreshing a great treat while on the road! Great quick meal if you find fresh strawberries! 2) Pull off spinach stems. 3) Cut spinach leave into strips. 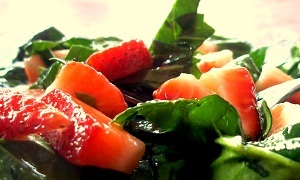 6) Toss spinach and strawberries together in a salad bowl. 7) Add oil, vinegar, and sugar to a small bowl and wisk with a fork. 8) Pour dressing over spinach and strawberries. Let everything sit for a couple minutes to let the flavors blend in. You can add juice from 1/2 orange to the dressing to give it a bit of citrus punch. Most of us desire a pain-free and scarless approach when it pertains to enhancing our appearances. I was ushered into a treatment room the moment I arrived. the skin in the treated area than people with lighter skin will note.